If you would like to see our Russell Luna and Laia live and direct, you will have opportunity to do this Saturday January 19 in Vigo IFEVI. It held the 64 and 65 National Dog Show CAC and the 27th International Dog Show CACIB We'll be there and hope to see you with your Jacks. We like very much to know them. If you want more details, see the website of Sociedade Canina Galega. Quiénes queráis ver a nuestras Russell Luna y Laia en vivo y en directo, tendréis oportunidad de hacerlo el próximo sábado día 19 de enero en el IFEVI de Vigo. Se celebran las 64 y 65 Exposición Nacional Canina C.A.C. 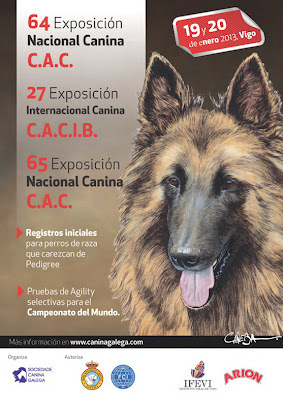 y la 27 Exposición Internacional Canina C.A.C.I.B. Allí estaremos y esperamos veros con vuestros Jacks. Nos gustará mucho conocerlos. 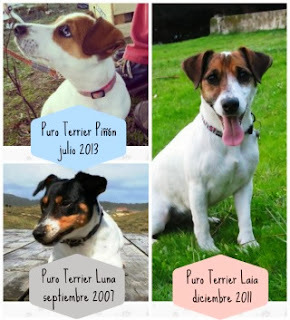 Si queréis ver más detalles, podéis consultar la web de la Sociedade Canina Galega.